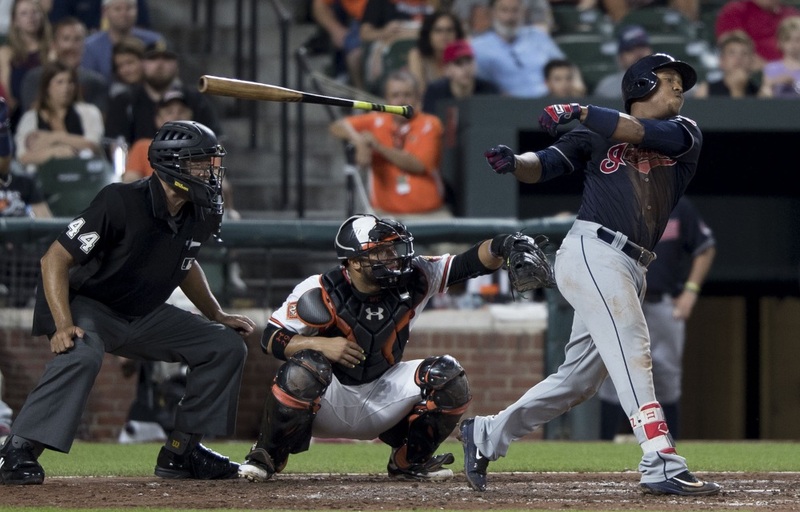 Jose Ramirez has considerable value even without his bat. As is the annual tradition at FanGraphs, we’re using the week of the All-Star Game — while (some of) the industry pauses for a metaphorical breather — to take stock of the top-50 trade assets in the sport. For more context on exactly what we’re trying to do here, see the honorable-mentions post linked at the top of the page. For this post and the others in this series, I’ve presented a graphic (by way of the wizard Sean Dolinar) breaking down each player’s objective skill level (represented, in this case, by a five-year WAR projection from ZiPS), contract/team-control details, rank in last year’s series, and then year-by-year details of age/WAR/contract through 2023, although a couple players have control beyond those five years. For those readers who are partial to spreadsheets rather than blocks of text, I’ve also included all the players we’ve ranked so far are in grid format at the bottom of the post. The ZiPS WAR forecasts did influence the rankings a bit: for players who were bunched together, it acted as an impartial tiebreaker of sorts, but the industry opinions I solicited drove the rankings. With that said, let’s get to the top 10 spots on the Trade Value list this year. Severino bests Kluber for the top spot amongst pitchers on this year’s list. He is eight years younger than Kluber with an additional year of control and has been at least as good as the Cleveland right-hander this season, depending on how you measure it. Predictably, though, execs are concerned — as they are with basically any pitcher — that Severino’s next pitch could lead to a year-long DL stint and uncertainty after that. As a 24-year-old who averages 97.7 mph on his fastball, Severino is still a bit of a risky bet compared to comparable hitters. There’s a tier here from Nos. 7 to 13 that you could shuffle in a few different orders depending on your personal preferences or evals of these players. Freeman is a pretty safe and steady bet compared to some of the more dynamic and volatile talents ranked around him. He’s essentially been the same six-win player for nearly three seasons now, he just missed time in 2017 with a broken wrist that kept his counting stats from reaching the same levels. He’s got 3.5 years of control remaining at a salary of more than $20 million per season, but that’s still clearly below market and he’s in the middle of his prime. Freeman figures to age better than the average first baseman given his build, durability, athleticism (evident by his surprisingly good run as a third baseman last season), advanced approach, and ability to make adjustments to his offensive game. You could argue he belongs at the bottom of this tier given his contract status, age, and position, but he comes with fewer questions than his peers and GMs tend to be risk averse when it comes to huge decisions. There was a solid debate raging in my inbox over who should rank higher between Turner and the next player in the countdown, Alex Bregman. They both should probably be playing shortstop, they’re nine months apart in age, have the same amount of club control, and come with similar draft pedigree. Amazingly, they’ve also recorded basically the same number of wins in roughly the same amount of major-league plate appearances. The pro-Turner argument is that he has a more well-rounded game and more athleticism, which should help him age a little better. As an aside, a young core of Turner, Victor Robles, and Juan Soto represents quite the place from which to start for a club that may be entering a transitional phase in 2019. Continuing from above, the pro-Bregman argument is that — in addition to having performed better over the last year or so and also possessing superior durability — he’s a better hitter and, in a more offensively oriented game, the bat becomes a separator. Turner will also be a hair more expensive, as he’s scheduled to enter arbitration a year earlier after earning super-two status. The vote was roughly 50/50 but I lean towards Bregman since I’m partial to the offense and durability argument and, as the slightly cheaper and younger player with slightly better by ZiPS projections, he has most of the tiebreakers in his favor. Here’s where we arrive at the top tier of value, composed almost exclusively of perennial six-plus-win players with below-market deals. Betts is tied for the least team control in this tier, so he makes the most sense in this slot. What he’s done on the field, though, has almost no equal. He had an insane breakout year in 2016, of course, hitting 31 homers and posting an 8.3 WAR. This year, though, he’s found a new level, having recorded the same strikeout rate as 2016 but doubling his walk rate and adding 116 points of isolated power. Betts’ projected 9.5 WAR would be the best non-Mike Trout WAR figure since Alex Rodriguez posted 9.6 WAR in 2007. Betts could also probably be average or better defensively at six positions, if that’s what you’re into. Correa has been on the DL with a back issue for about a month and he missed six weeks last year with a torn ligament in his thumb. Other than those two issues, there isn’t much to complain about with Correa: as an athletic, young, big-bodied shortstop who’s good at seemingly everything, he’s basically everything what you want in a franchise player. He’s been a five-win player when healthy but is still just 23. Scouts and ZiPS alike see a ceiling for even more. This is where things got really tough. Similar to the Bregman/Turner debate, I got a lot of different advice on how to handle places No. 2-4. What it boiled down to for me was two cost-controlled elite players versus a heftier salary on Trout, who is far and away the best player in baseball. You can’t ask something simple to settle this like, “Would the Yankees trade Aaron Judge for Trout?” — first because that isn’t a simple answer (most think they would, if forced to decide in a take-it-or-leave-it scenario) but also because we’re trying to answer this for all 30 clubs, not just one. That when I realized the only way to settle this is to poll/project a preference for all 30 clubs and see which of these players was most desirable in a systematic way. When you split the league into small, medium, and large payrolls, you realize the robust part of Trout’s market is the large payroll clubs. The problem, though, is that some of those clubs are treating the luxury tax (CBT is the formal name) like a hard salary cap of sorts. If not even all of the big-market clubs would definitely take Trout (I pegged eight to 10 that would take him over No. 3 on this list) if a comparable value were available, then I felt like he belonged fourth. In addition, while $33.2 million annually still represents a below-market price for Trout, trading for him midseason would be a tall order for most clubs (particularly with both alternatives making the league minimum), making it even a little more complicated. A couple contending/larger-market clubs made the case for Trout at No. 2 and these three players are all very close, so that’s the right call for them. If wins in 2019 are of utmost importance for a club, that additional 3.7 projected WAR for Trout carries greater marginal value, raising the dollar-per-WAR that the hypothetical contender would spend. I can feel some readers’ faces turning red reading this, like I’m disregarding the fact that Trout is the best player in baseball, but the payroll limitations of some clubs combined with the industry’s general economic environment conspired to land Mr. Trout here, just behind some comparable talents who feature more control at a cheaper price. The closest competition for Trout was Judge, a player who has given scouts fits for years as they attempt to figure out what he’ll become. In college, many considered him the cheap knockoff of Giancarlo Stanton, struggling at times at Fresno State as a 21-year-old while Stanton, with similar physical tools, had hit 56 homers in the big leagues by that age. Even as a minor leaguer, Judge was regarded by some scouts as more a fringe regular or platoon player who was simply too big to make consistent contact. Kudos to Judge for figuring all this stuff out and outperforming even the most aggressive projections. Nevertheless, some of those traits that gave scouts pause (mainly the aging curve for giants) are still worth monitoring as Judge ages. With all of that out of the way, Judge has put up nearly 13 wins in just over a year and a half, he’s in his prime, he’s making the league minimum, and he comes with 4.5 years of control. It sure seems like he’s good for five-plus wins each year of that and the basic algorithm I used to help form these rankings has Judge worth about $25 million more than Trout. There’s a little more risk given the shorter track record and singularity of Judge’s profile, but the extra two years of control are huge, along with a salary that should also make him about $20 million cheaper than Trout over the controlled years. As if Lindor’s electric tools and style of play weren’t enough, he was also delightful to watch talking with the broadcast crew from the field during the All-Star Game. According to the projections, Lindor is likely to jump from a previous career high of 5.9 WAR (recorded last season) to over 8 WAR this year, fueled by some positive BABIP regression and somehow improving on last year’s improbable 33-homer showing. Lindor is one of the rare players with five plus tools who also has plus instincts and (knocks on wood) durability. He’s making the league minimum this year and still has three years of arbitration, which won’t be cheap but will still be well below market for him. Judge has an additional year of control, but Lindor is more traditionally athletic — he has more speed and defensive value — and remains in that range during which his athleticism will be at its peak. I’d like to say the top spot was a tough call and break down a 33-point recap of how I landed on this one, but it seemed like this would be the guy from early in the process. The mean projection for Ramirez calls for him to produce 9.4 WAR and 41 home runs while also recording more walks than strikeouts, plus defense, and league-leading baserunning metrics. As if it weren’t enough for the Indians to have the second-most valuable trade asset in baseball who is plus at everything and had an out-of-nowhere power spike, well, here’s another one. Ramirez had his big breakout year in 2016 and, before the 2017 season started, the Indians smartly locked him up to a long-term deal, gambling that there was more of the same in the tank and giving Ramirez the first real payday in his career. As you can see, he’s going to be making well below-market salaries until 2023 and they aren’t even all guaranteed, but it’s hard to imagine these club options don’t get picked up. Having three of the top 12 trade assets in the game is one reason why Cleveland is leading their division and will likely be doing that a lot in the coming years. We hoped you liked reading 2018 Trade Value: #1 to #10 by Kiley McDaniel! How Well Do Good Relievers Hold Up? Kiley McDaniel has worked as an executive and scout, most recently for the Atlanta Braves, also for the New York Yankees, Baltimore Orioles and Pittsburgh Pirates. He's written for ESPN, Fox Sports and Baseball Prospectus. Follow him on twitter.